Rivers are classified on the basis of different factors, including by their physical makeup, speed, and shape. The speed of a river is one way in which it can be classified. One of the most important components of any environmental study is water. Its importance has made rivers, oceans, streams, and lakes the subjects of many research projects. Because of this, a plethora of information can be obtained about rivers, including their length, depth, speed, direction, ecosystem, and flow. In order to measure and record the characteristics of rivers and other waterways around the world, scientists have developed several classification systems. Rivers can be classified by: biotic status (its living things), topography (its physical shape and features), whitewater (for recreational purposes), and by the Strahler Stream Order. 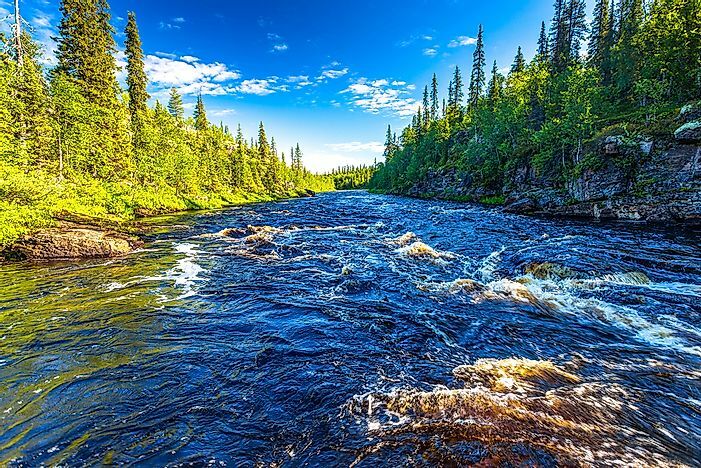 This article takes a closer look at these river classification systems. Biotic classification refers to the type of ecosystem found in a particular river. This classification includes the purest, cleanest rivers as well as the most contaminated. One common system divides rivers into 3 principal zones: potamon, rhithron, and crenon. The potamon zone describes the downstream area of a river. Because this area has slower water flowing speeds, its temperature is generally warmer than other areas of the river. Additionally, the potamon zone is characterized by a sandy river bed and lower oxygen content. The rhithron zone describes the upstream area of the river. It is characterized by faster and more turbulent flowing speeds. These faster speeds contribute to cooler temperatures in the rhithron zone. Additionally, this biotic river zone has a higher oxygen level than the potamon. The crenon zone describes the area near the source of the river. This zone is subdivided into the eucrenon, which is the spring zone, and the hypocrenon, which is the headstream zone. Because this is where the river gets its start, its flow speeds are much slower than those found in the rhithron zone. Additionally, the crenon zone has lower oxygen levels and colder temperatures. Biotic classification also identifies the sensitivity to and recovery time from environmental disturbances of specific habitats. For example, a microhabitat is considered highly sensitive to disturbance, but has a quick recovery time. In contrast, wetlands are less sensitive to disturbance, but require a longer period of time to recovery the effects of an environmental disturbance. Topography classification refers to the physical makeup, shape, and features of the river. Rivers fall into 1 of 3 categories: bedrock, alluvial, or a mix. Bedrock rivers are formed where water cuts through newer levels of sediment and works its way into the bedrock beneath. This is most likely to happen in geographical regions that have experienced an upward shift in the earth’s surface, such as mountainous regions or uplands. Bedrock rivers are known for their content of alluvium, which is loose soil or sediment. This loose sediment moves with the water, eroding and shaping the river along its way. One example of a bedrock river is the Colorado River in the United States. Alluvial rivers are characterized by the presence of floodplains (the land next to rivers that is frequently flooded) and channels (the river route) that have been formed in loosely consolidated sediment. Flooding is an important component of alluvial rivers as it maintains the primary route filled with water and allows for the formation of oxbow lakes, side channels, and wetlands. As alluvial river water flows, it erodes the banks of the river and deposits the resulting sediment into the floodplains or sandbars in the middle of the river. These rivers are further categorized by the pattern of their water flow - in other words, the direction the river flows in. These classifications include: wandering, straight, braided, meandering, and anastomose. The habitats within alluvial rivers range from deep pools to shallow and turbulent waters. Mixed bedrock-alluvial rivers, as the name suggests, combine the previous features. These rivers flow through layers of bedrock and areas of deep alluvial deposits. Researchers are able to determine the age of rivers by studying their erosion patterns. For example, young rivers are characterized by their rapid flow, lack of tributaries, and deep rather than wide channels. Mature rivers have less steep grades than young rivers and are characterized by the presence of several tributaries and a rapid discharge speed. Old rivers can be identified by its floodplains. Finally, rejuvenated rivers have gradients and are raised by tectonic movement. In addition to being important components of healthy ecosystems and a source of freshwater resources, rivers also provide recreational opportunities around the world. One of the most popular river activities is whitewater rafting, or navigating the river in boats and over a wide variety of waves and speeds. In order to prepare for a rafting trip, knowing the whitewater classification is important. The International Scale of River Difficulty includes 6 classifications. Class I: River difficulty is easy with fast flow and small waves. Class II: River difficulty is novice with wide rivers and medium-sized waves. Class III: River difficulty is intermediate with irregular waves that can take over a canoe. Class IV: River difficulty is advanced with powerful waves, holes, and restricted passages. These rapids require fast boat handling and the risk of injury to swimmers is considered moderate to high. Class V: River difficulty is expert with violent waves, dropoffs, and complex passages. These turbulent rapids continue for long distances before calmer pools are reached. Class VI: River difficulty is extreme and exploratory; it is considered extremely dangerous. These rapids come with a high possibility of error and are so difficult to navigate that rescue may be impossible. Proposed in 1952, the Strahler Stream Order is based on the Strahler number, which is used to demonstrate the complexity of branching numbers. It applies this same concept to rivers and creates a type of pyramid order based on tributary numbers. The order classifications range from the 1st order to the 12th order. Headwaters, for example, belong to the 1st order, while the Amazon River belongs to the 12th. Researchers have determined that approximately 80% of the world’s rivers and tributaries belong to the 1st and 2nd orders. These waterways are typically located on steep inclines from which they flow downward at a quick pace until joining the next order of waterway. The larger the order number, the larger and slower the river.